Sayers offer a full and bespoke colour matching service, using the latest digital technology and fully trained colourist. 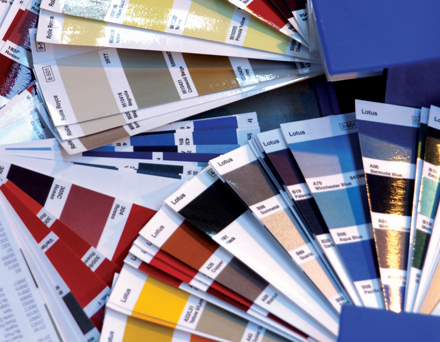 Accurate colour matching is one of the most difficult tasks within all market sectors nowadays due to the extreme advancement of colour pigmentation. Sayers boast a state of the art colour matching facility, with the very latest equipment, which enables us to reach the highest standards of colour accuracy that is required for one-off colour production. Our team of highly skilled colour mixers and a fully trained colourist with many years experience in the industry. We can match all industrial finishes to any texture or matting level that is required with these type of products. We can also provide special effect colours for the specialist vehicle market place, motorcycle finishes, racing car livery and commercial transport colours. All of this is recorded in a comprehensive library so repeat orders can be produced quickly and accurately when required. We believe this is a unique but necessary service that we provide, to enhance our service to the customer.